Home > Communications, Technology, Media > Telephone, Telegraph, Broadband > Maryland Telecommunications, Inc. 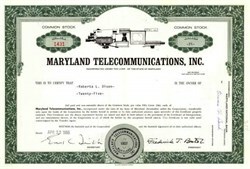 Beautifully engraved certificate from the Maryland Telecommunications, Inc. issued in 1966. This historic document was printed by the De La Rue Banknote Company and has an ornate border around it with a vignette of video cameras and a television. This item has the printed signatures of the Company’s President and Secretary. Maryland Telecommunications, Inc. (MTI), founded in 1957, became the largest low light level television manufacturer, primarily designing products for the medical industry. Throughout its history, MTI has specialized in high performance, high resolution and low light level cameras for the scientific and medical industry.